For families who live near a busy school, especially a primary school where parents come right up to the school gate to drop off their children every day, traffic congestion at the start and end of the school day can be a serious problem. This may be exacerbated when parents park selfishly, blocking nearby roads or parking too near crossings in order to park their vehicles as near as possible to the school gate. People who live near schools might also find their own drives are blocked so that when they want to move their own car out of the household they cannot as a dropping off parents has parked in front of their car - 'just for a second'. Some problems cannot be solved: parents of children who come from a long distance may have no alternative but to drop off their kids every day in a car, and any school will usually result in at least slightly increased congestion during pick up and drop off times. If people find, however, that the congestion problems are getting out of control, it is a good idea to approach the school to see if a solution can be found to lessen or at least attempt to lessen the congestion problem. Some solutions might include the starting up of a 'walk to school club' or the school may try to encourage parents to do rotas and so fewer cars would descend on the school every day. 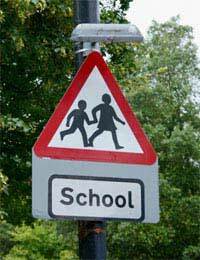 A larger scale solution might be for the school and its neighbours to jointly approach a local council to put in yellow restrictive parking lines or employ a lollypop road-crossing warden to make it safer for children to come to school without parents having to drive them. This letter format laid out below is a sample piece of correspondence from people who are neighbours of a busy school to the head teacher of the school to ask about scheduling a meeting to discuss the heavy congestion their road is suffering from as a result of the school. The below letter can be used as an example of the kinds of tone with which it is best to contact a school in order to ensure the best kind of response. We live at 42 School Lane, just seven doors down from your school. We have now lived in this house for 11 years, but recently have been experiencing much increased problems with local congestion during the school drop off and pick up times, and the issue is really growing out of control. We are writing to you in the hope that together we can come up with a solution that does not involve something drastic like the council putting in a controlled parking zone to stop parents from parking inconsiderately, but that still helps us to park outside our own house - and not to get stuck behind lines of traffic twice every day! One of our friends had a similar problem and the school initiated a 'walk to school' scheme where children joined together with one adult to walk to school; this is a healthy idea that also cuts down on congestion. We would appreciate the opportunity to meet with you to discuss this issue and possible ways to solve the problem. We await your response: you can contact me, Lydia, on 0121 2343 9049 or 0723422342, or email me at lydia@neighbours.com, and hopefully we can quickly arrange a convenient time to meet and help put an end to this daily inconvenience.